I’ve lost count of the number of times I’ve visited Fiji. Travelling by land, sea and air, I’ve bunkered down in barefoot-style budget beach bures through to the most extraordinary luxurious resort. Despite living in the tropics on a similar latitude to Fiji, there’s a kind of serenity that washes over me in that frangipani-scented balmy air. 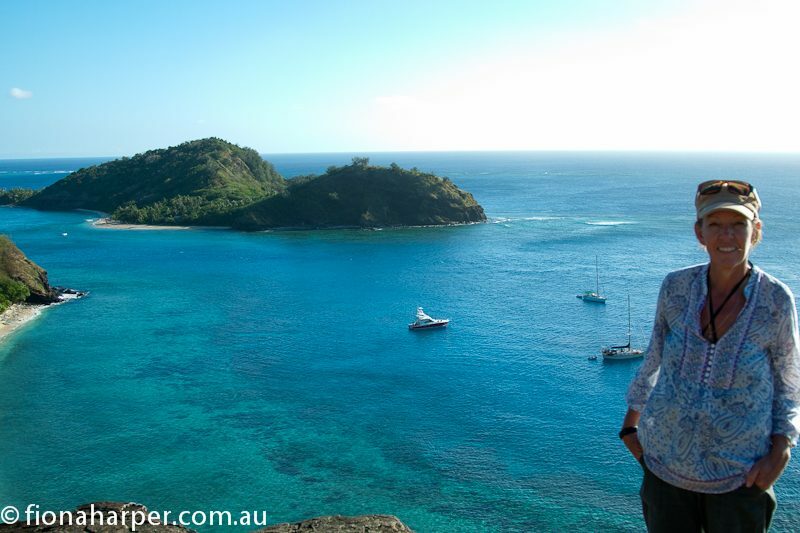 Fiji’s dreamy archipelago and her graciously friendly people draws me back constantly. I’ll readily admit to being one of her biggest fans. After four visits I made a pact to return to Fiji to see out my final days when old age creeps up. It was a whimsical kind of half-hearted plan made during a severe bout of ‘post-Fiji’ blues. On another visit I inspected vacant land near SavuSavu with the intention of building a simple thatched bungalow. On days when I’m stuck indoors writing with a mountain of deadlines looming, it’s a vision that still sustains me as a retirement plan. Indeed, as another year looms like a tantalising book yet to be opened, it’s not out of the question to sling a backpack aboard a Fiji Airways flight and take advantage of cheap flights to Fiji from Sydney. With plans to complete a couple of major writing projects on the go, a beachfront Fijian bure seems like a pretty good place to call home for a while. Fiji has that effect on people. I’ve seen it countless times. Both as a travel writer and in a previous life as a travel agent. It’s the kind of place that gets beneath your skin, tugs at your heart strings and buries itself deep within your soul. Sure there’s an element of romance about the balmy South Pacific. But Fiji offers much more. Laced with a Christian faith that underpins much of the culture, it feels a little like coming home each time I step foot on her soil. According to the village spokesman who greets me as I come ashore on Kioa Island, “Our people came to this island to start a new life in Fiji in 1946 after our island, Vaitupu, became over crowded. Volunteers came first, then the rest of the population followed. Today, we are Fiji citizens but our heart is Tuvaluan,” he says, placing his hand over his heart. His symbolic gesture is the cue for the few hundred villagers gathered to break into song once again, singing stories of their Polynesian homeland. The beachfront community hall is charged with emotion as men of all ages seated around a communal drum beat it loudly, enthusiastically. Sitting cross legged on all sides, villagers clap hands and sing while handsome young ladies and men line the walls, their hips swaying in unison. Adorned with traditional costumes made from raffia and woven palm fronds, their heads festooned with colourful floral garlands, their faces break into wide-mouth smiles as harmonic voices seem to raise the roof from the rafters. Their passion for song and dance is palpable. And infectious. I clap and sway with the rhythm. 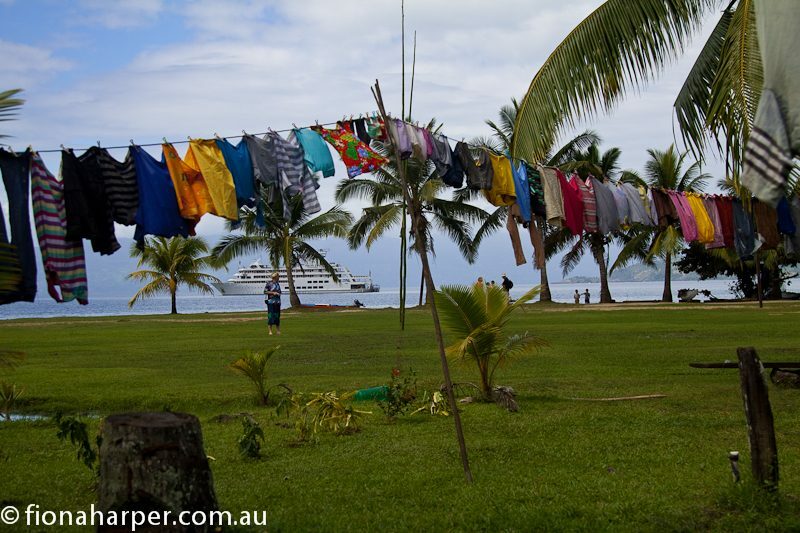 Stepping ashore briefly from MV Reef Endeavour during a Captain Cook Cruises Discovery Cultural Cruise, we’re circumnavigating Fiji’s second largest island, Vanua Levu. Promising to visit ‘places without postcards’, many of the villages we call into are little visited by travellers. Island hopping, we dip our toes into the melting pot of Indo-Fijian, Polynesian, Micronesian as well as Melanesian-Fijian cultures. 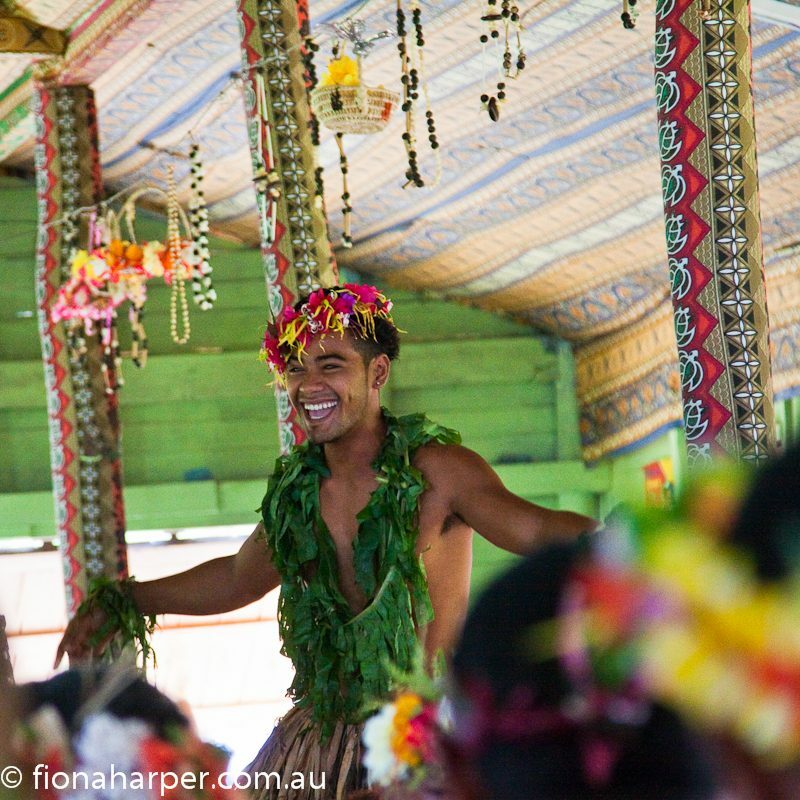 Cruising far-flung islands onboard MV Reef Endeavour, the 7 night cruise offers a fascinating insight into the many facets that comprise multi-cultural, multi-racial Fiji. The SomoSomo Strait is well known amongst divers for fertile currents that feed the extensive soft coral gardens. This same current takes our ship northwards from Kioa Island to Rabi (pronounced Rambi) Island, another mountainous island with an immigrant population. Displaced by British phosphate miners who stripped their tiny homeland during feverish mining of guano (used in the fertiliser industry), Banaba Islanders were relocated to Rabi Island around the same time the Tuvulans were on the move. They must be a stoic lot, Banaba Islanders. Prior to this mass relocation, survivors of the WW2 Japanese invasion were deported to the Caroline Islands to serve as indentured labourers prior to moving onwards to Rabi. Today, from their new home their song and dance reflects the lost connection with the island and ancestors they left behind. 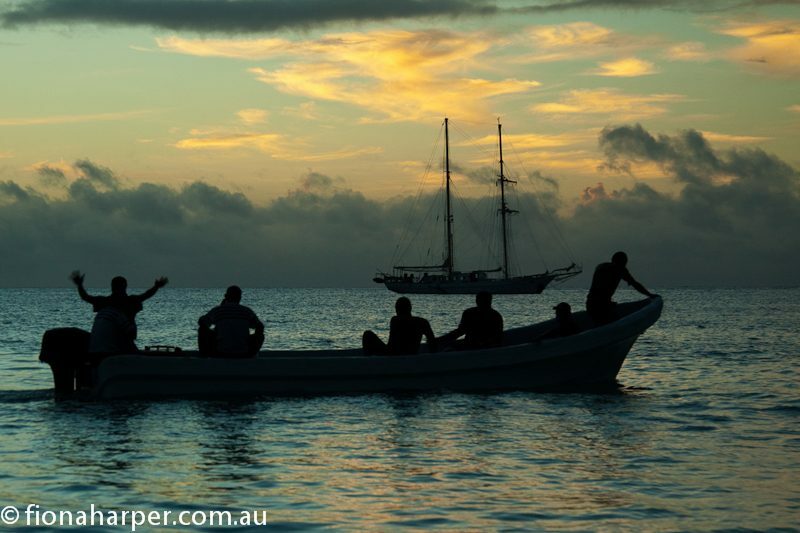 A group of these gentle-natured people come onboard MV Reef Endeavour one afternoon as we are anchored nearby. 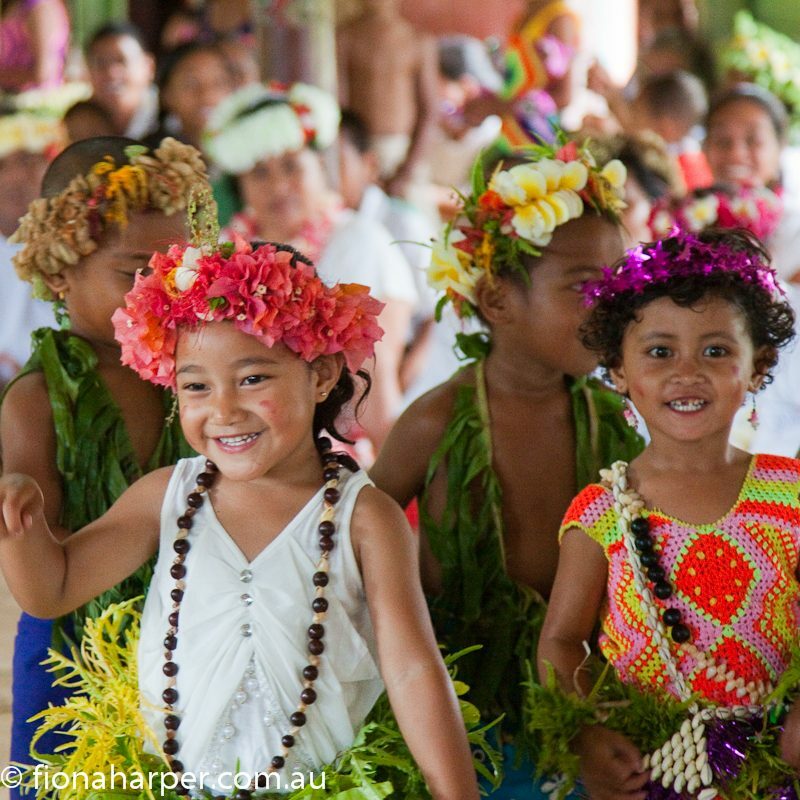 Coffee-coloured skin glistening, young dancers in grass skirts, shell bracelets and anklets, the women in raffia bras, dance to the Micronesian rhythm of acoustic guitar, clapping and harmonic voices. Long dark hair brushing their buttocks as they sway, a middle aged lady in the group is thrilled to be temporarily reunited with her nephew who works onboard our ship. Continuing our cultural journey, another shore excursion finds us visiting Drua Drua Island, where the villagers and school children eagerly anticipate our visit. Many passengers have brought books, pencils and other gifts specifically to assist children who suffer the consequences of their remote location. Where most of us exist in a technology-driven world, these kids close their books before the sun sets as there is no electricity for reading after dark. Naturally, mobile phones and computers are non-existent in the absence of power to charge the gadgets that most of us take for granted. School Principal Semi Goletoka gives us a guided tour of the classrooms and dormitories where 65 students board on-island to attend classes during the school week. “I was posted here two years ago,” he says proudly. “We care for these children 24 hours each day so that they may have an education. We face many challenges, but the most important goal is to get electricity into the school,” Semi says from the steps leading to his classroom. As we are entertained with song and dance on the village common by school children, the obligatory collection box sits nearby. As honoured guests and visitors, it’s a consistent theme as we continue our journey through islands that seem peacefully idyllic at first glance. The reality is, however, that many remote villages struggle to sustain themselves beyond subsistence living. And, certainly in Drua Drua Island’s case, with their humble goal to buy a generator so that students may learn about computers and be connected via the world wide web, many of my fellow passengers are happy to make a donation. It’s a small price to pay for the warm hospitality we receive. Welcomed on the beach as we disembark our tenders, invariably there is singing, rhythmic clapping, guitars and joyful song. The good humour is infectious as giggling locals take our hands, inviting us to join in impromptu dancing as we await the rest of our group. It’s hard not to join in, causing much giggling hysteria amongst onlookers. As Principal Goletoka says, “we educate our children not only in arithmetic and English, but also with morals and values so that they grow up to be good people.” In many countries you wouldn’t think about wandering through an unfamiliar village in case you were accosted. In Fiji, such random meanderings are not only safe, they are enthusiastically encouraged by villagers in these outlying islands (after first gaining permission from a village elder). Leaving Drua Drua behind, wading through the shallows to our tender, I return to our ship feeling somewhat humbled. With song ringing in my ears, as I switch on my computer and download a swag of unwanted emails, I’m also just a little envious of a lifestyle bereft of pesky technology that demands my instant attention. 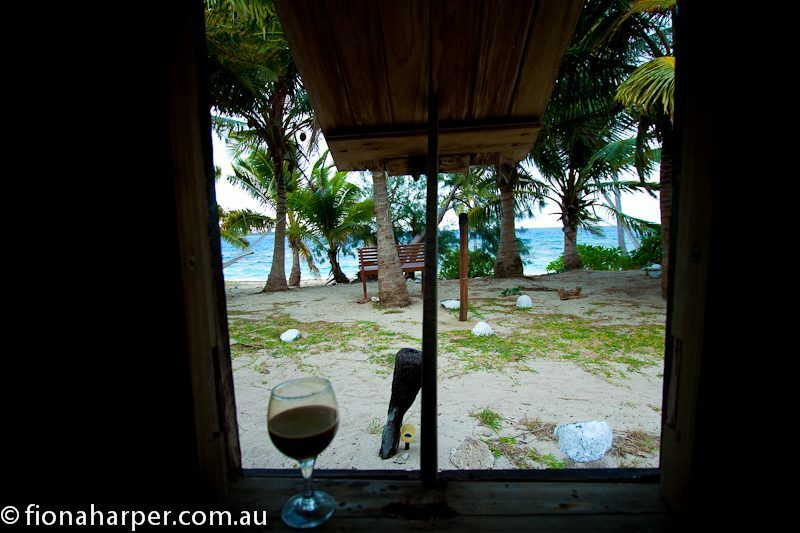 It’s time I found that beachfront bure and started my own writers in residence escapade. Fiji Airways, Fiji’s international airline, has been connecting the world with the South Pacific for 60 years, awarded ‘Best Airline in the South Pacific’ by readers of Global Traveler Magazine for the 3rd year running. We’re glad to here you enjoyed this Fiji article Dani! Fiji is one of our familys favourte holidays. We’ve been twice and can’t wait to go back this year. Maybe Yasawas this time. Mmm the Yasawas are devine. Stay as long as you can. I didnt want to leave! What a well-written article. I really enjoyed it. I was on the Reef Endeavour a couple of weeks ago!